WARNING: THIS POST CONTAINS DISTURBING PHOTOGRAPHIC IMAGES THAT ARE PART OF AMERICAN’S NATIONAL HERITAGE. THEY ARE USED TO ILLUSTRATE THAT THE PHASES DISCUSSED BELOW WERE LIVED BY REAL PEOPLE. In this country, our history is replete with strong and unmistakable messages that BLACK LIVES DO NOT MATTER!, which makes any scoffing at “Black Lives Matter” OBSCENE. Yes, Governor Bush and others, all lives do matter. But, you silly asshats, the Black Lives Matter movement IS NOT about saying that Black lives matter more than other lives. It IS about exposing and attempting to eradicate an ENDURING injustice that is a very dark and nasty part of our national history, which is too often swept beneath the rug of the 24 hour news world. Our national history screams out to every Black American—BLACK LIVES DO NOT MATTER! The active racist elements of our society have focused much of their appetite for inter-racial violence on Black men and their record of abuse is formidable, but they have not ignored Black women and children. None the less, this essay largely focuses on Black men. 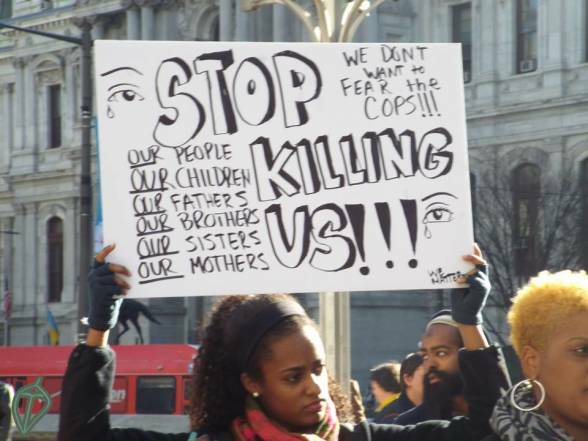 I personally see six stages in the historical record of the message that BLACK LIVES DO NOT MATTER! We have been murdering Black men in this country for centuries. Black men and women were first property to treated, or be disposed of, as the “master” wished. Now some might go, “Oh, but who would just kill his investment like that?” The answer is that the thread that held ante-bellum Southern society together was the acceptance of white dominance. If you killed an obstreperous slave you may have lost an investment, but you reassured yourself, your slaves, and your neighbors that you maintained that precious dominance. When the first stage ended with the Civil War, then white supremacists, which meant almost all whites, used vigilantism to kill Blacks. The Ku Klux Klan, Knights of the White Camellia, The White League, The Red Shirts, and groups of other supremacists, often composed of Confederate Civil War veterans, terrorized Black communities and, in some areas, murdered Black men at will. “He didn’t take off his hat as I passed” was enough to impose the death penalty in this era in some regions of the South. [http://www.pbs.org/tpt/slavery-by-another-name/themes/white-supremacy/]. After Blacks had been banished from the ballot in the South and White Supremacy assured in the public realm, the violence did not stop. Between 1877 and 1950, White Americans in 12 southern states lynched 4,000 Black Americans, the vast majority of them were Black men. Lynching peaked in the late 19th century and then declined in most states. If one reviews evidence from this period, these events were very often not the act of masked men skulking in the night. The authorities almost never intervened in these events. In fact, the participants often included judicial and law enforcement officials. Lynching was also frequently a mass attendance event where Black men were tortured and killed, while entire communities watched and purchased snacks from vendors. One can read the Equal Justice Institute’s publication, Lynching in America, for more than enough details [http://racialjustice.eji.org/]. With the decline of lynching in the early twentieth century (bad for business and brings too much bad publicity), the disproportionate use of the death penalty became the device for proving that the lives of Black men didn’t matter. “The crux of the matter is the white control of formal force, the police, sheriffs, justices of the peace, judges, and juries. Much of the direct action against Negroes is indeed taken through these very agencies”. “These data include 217 executions that occurred in 111 of the 261 counties included in this analysis. O nly 45 (21 percent) of these executions involved white offenders. The remaining 172 (79 percent) were executions of black offenders. Ninety of the 111 executing counties used the sanction more frequently on blacks than they did on whites. The discriminating counties, on the average, executed approximately one black for every 3,000 blacks in the county. These same counties executed one white for approximately every 100,000 whites in the county. Though the discussion above focused on the death penalty, other aspects of the criminal justice system served and still serve (review material on fines in Ferguson, Missouri and Charles Blow’s recent NYT opinion piece), the same ends. The nation has now entered Phase Five of Black Lives Do Not Matter! 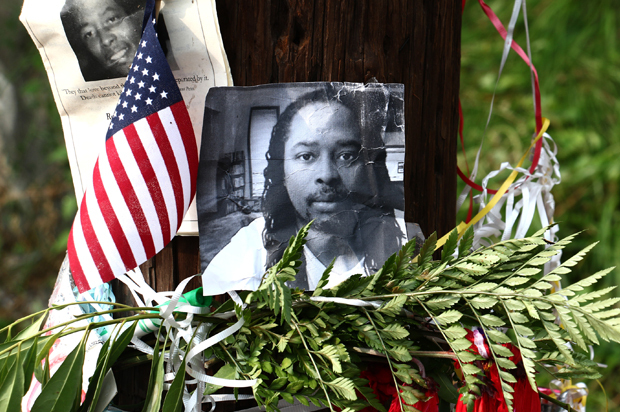 Largely, in the last two or three years, considerable video evidence has emerged that displays the cavalier way that many members of the law enforcement community treat the lives of Black men. A month rarely goes by without another event capturing the nation’s attention for a fleeting moment. The list of lives needlessly lost grows longer every day. However, this is no news to members of the Black community or to police. These two groups have always known that authorities have a free-hand in policing Black people in general and especially poor Blacks. Until now, they have been able to hide their misbehavior behind the rationale that “the cop said the dead man did X.,” often followed by “that is what the other officer said as well.” The police officers’ words became an unquestioned gold standard for grand juries, prosecutors, and trial juries. Then, this dark underbelly of our society was figuratively and literally exposed to glaring light by citizens’ cameras, dashcams, and bodycams. 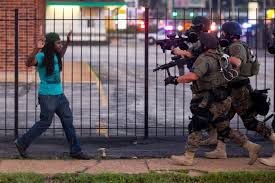 These exposes have shown White Americans what happens if you are a Black and have an encounter with police that the officer sees as somehow tense or threatening—a Black man becomes fair game for fatal violence. Phase Six is our future. Calls have gone out from citizens and all levels of government for reform of the criminal justice process. The “camera age” is now moving into the world of policing with bodycams, dashcams, street cameras, and heightened citizen awareness combined with the ubiquitous phone cameras. The fundamental questions that remain are simple to state but satisfactory answers require strong and enduring political will. Will police become more a reflection of the communities they serve than a reflection of the dominant culture? Will police drop their focus on “aggressive policing” that focuses on poor neighborhoods and emphasizes official (often disproportionate) responses to minor infractions? Will the police move away from the “failure to obey a lawful order” mantra that they use to cover so many sins? Will mandatory minimums sentences be dropped for minor offenders and alternatives to imprisonment developed? Will police training focus more on de-escalating encounters than how they prove their right and ability to dominate all encounters and all citizens? Will police officials provide leadership that proves to officers that misconduct will be punished, as will any cover-up of misconduct? How well the dominant culture answers, or force appropriate answers, to these questions will determine whether the BLACK LIVES MATTER! can fade into our history after a job well done. 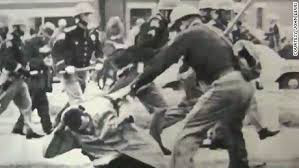 The image below is of the police response to the Selma March. Many who see it may think that type of “thing” is a closed chapter in our history. Unfortunately, NOT true. The Devil Still Lives : Gilbert King’s DEVIL IN THE GROVE: THURGOOD MARSHALL, THE GROVELAND BOYS, AND THE DAWN OF A NEW AMERICA.